May 25, 2013. 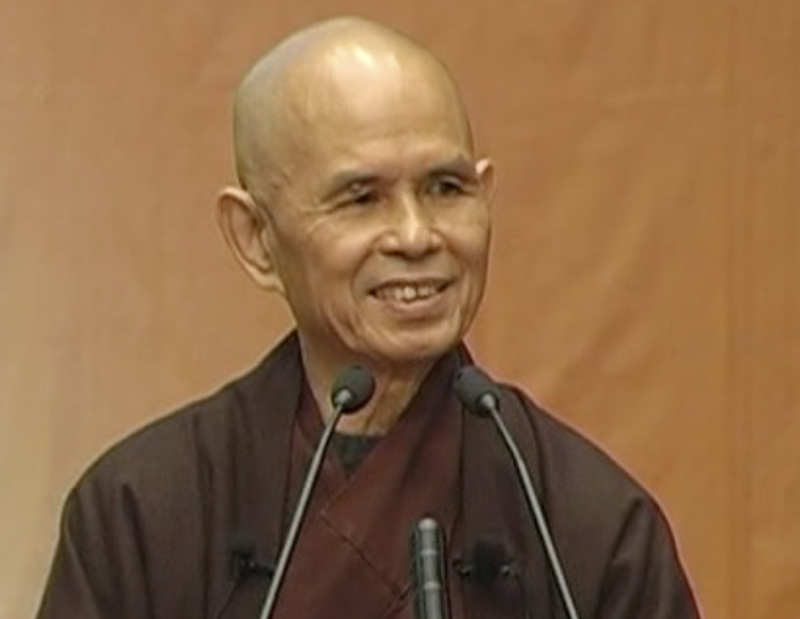 87-minute dharma talk given by Thich Nhat Hanh from Hong Kong. The sangha is on the spring Asian Tour and this talk is given in English with consecutive translation into Chinese. The theme of the retreat is Happiness is the Way. To meditate is having the time is to look deeply. We first take the body. This is the object of our meditation. Mindfulness of body. We review briefly the realms of the exercises on breathing: Breath, Feelings, and Mind. The focus of the talk is on the mind. We start with the concept of mental formations. How do we work with and identify our mental formations. To meditate also means we sit at the river of mental formations and recognize each as they go by. What is store consciousness and mind consciousness? We can water the good seeds in our consciousness. Let us vow to water the good seeds in ourselves and in the other person. The practice of selective watering. The practice of Right Diligence. This brings us through the for ten exercises from the Sutra on the Full Awareness of Mindful Breathing. There are six more but we’ll continue another day. The talk shifts to the Fifth Mindfulness Training (35-m) on consumption. The Sutra on the Flesh of the Son illustrates consumption. It speaks on four kinds of Nutriments. The first is edible food. The second is sensory impressions. How do we consume media, products, etc. The third is volition. What is your deepest desire? The fourth food is consciousness. January 27, 2013. 76-minute dharma talk given by Thich Nhat Hanh from New Hamlet at Plum Village. The sangha is in the 90-day Rains Retreat (Winter Retreat). This is the twenty-fourth dharma talk of the retreat with the theme Are You The Soulmate of the Buddha? The talk is given in Vietnamese and this is a translation provided by Sr. Chan Không. In first 17-minutes, we arr reminded how to be in touch with yourself. Through walking meditation and no thinking. When we walk, we walk relaxingly and solidly. Every step is solid and every step is freedom. And with Freedom you can arrive in Nirvana. Nirvana is extinction of all the affliction. Walking meditation can be very profound. Three Dharma Seals. Impermanence. No self. Nirvana. The island of self. There is no way to Nirvana, nirvana is the way. At 45-minutes, we look at the Four Noble truths and noble eight fold path. The five mindfulness trainings are a concrete manifestation of this path to Nirvana. What are the five mindfulness Trainings? Includes a discussion of the four Kinds of nutriments.